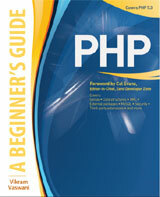 PHP: A Beginner's Guide is intended for use by users who are new to the PHP programming language. Unlike many other books, PHP: A Beginner's Guide doesn't assume prior knowledge of Web programming or database fundamentals. Rather, it teaches by example, using in-chapter projects and examples to explain basic concepts and, thus, gradually increase the reader's familiarity with PHP concepts and programming tools. Therefore, it is most suitable for novice programmers who are familiar with HTML and CSS, and are interested in widening their skill set to also build dynamic, data-driven sites using PHP. PHP: A Beginner's Guide contains information on the PHP 5.2/5.3 programming toolkit and its most commonly-used features: MySQL and SQLite database integration, XML processing capabilities, and third-party extensions. It provides one-stop coverage of software installation, language syntax and data structures, flow control routines, built-in functions, and best practices. Each chapter also includes numerous practical projects that the reader can "follow along with" to gain a practical understanding of the material being discussed.